Traditionally in my family there was no better way to show your love for someone than feeding them something delicious and homemade. Not one to break that tradition, I always attempt to make something for Dear Hubby for Valentine’s Day that involves his favorite food, chocolate. Well, that is until this year. He has decided to curb his chocolate consumption and since I do not want to be the one who tempts him “off the wagon” I took on the challenge of creating something he would love. And while, as a chocoholic, he may never love any food ever as much, he did appreciate my sincere effort. 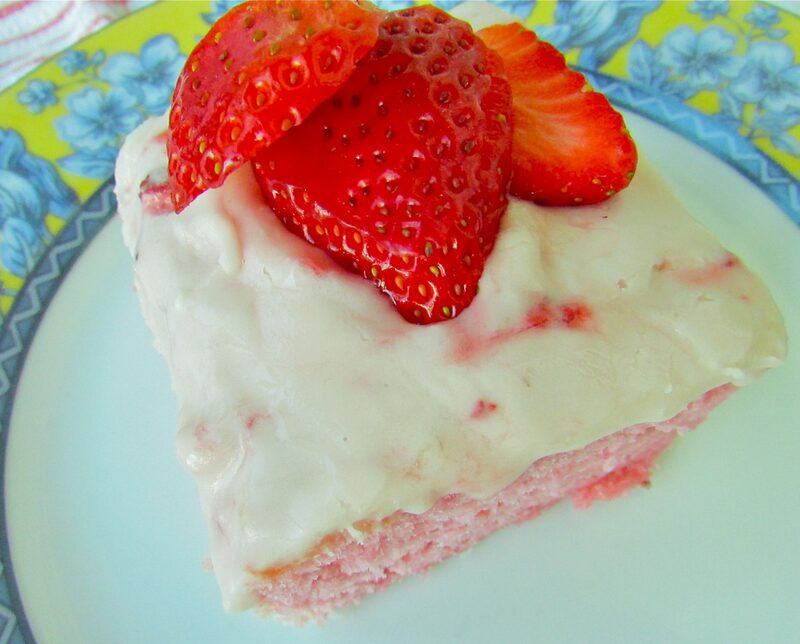 I wanted to bake a strawberry cake that was not made with a cake mix (this is pretty much a no-no with me) or one that derives its flavor from boxed strawberry Jello. Mine would be a FRESH strawberry cake. 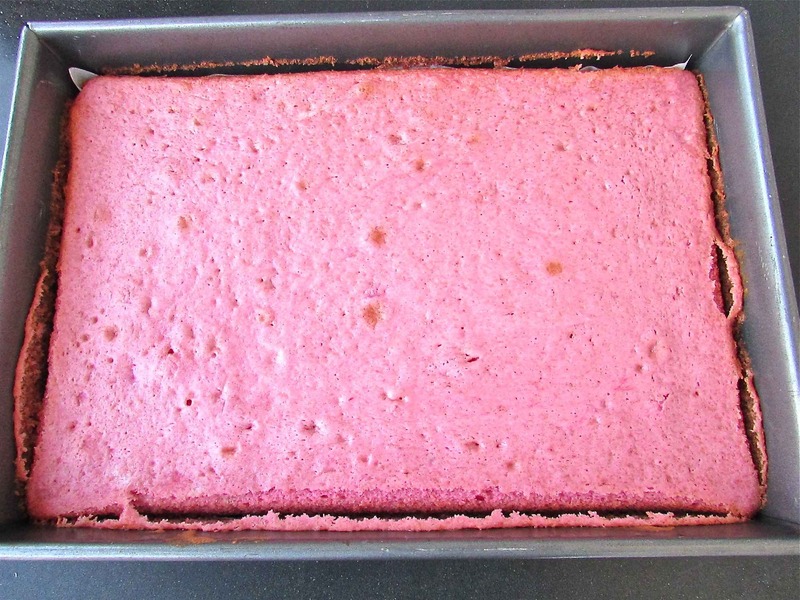 After researching and testing I came up with an excellent, moist cake that is just the right shade of pink and carries an outstanding FRESH strawberry aroma and taste. 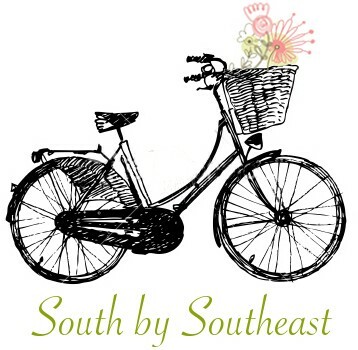 It is based off the basic vanilla cake from Southern Living magazine with many tweaks. I am proud of myself with this one! There are a few things to take note of, however. 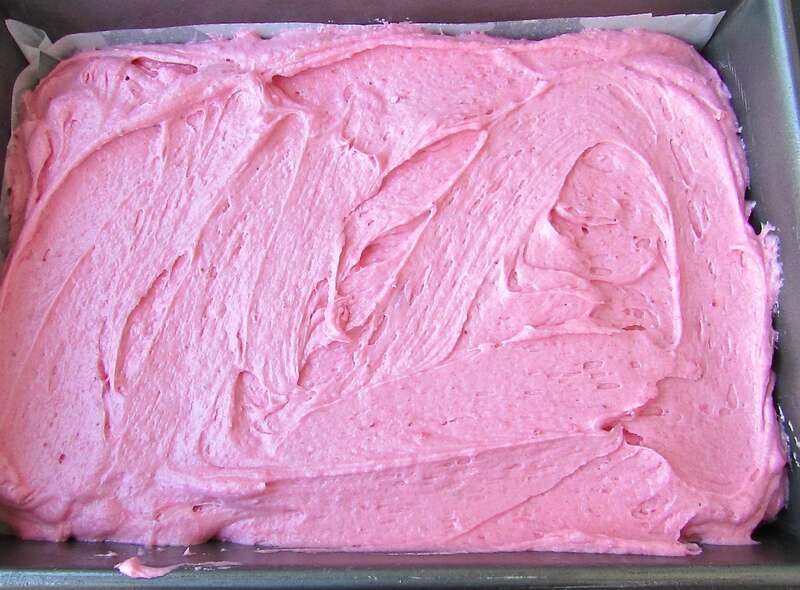 The frosting uses FRESH strawberries as well, so the amount of confectioners sugar required may vary according to the juiciness of your strawberries. The frosting was on the thin side, but thick enough to hold onto the cake. Just allow the cake to cool completely before frosting. I also set the frosted cake in the frig for about 10 minutes to “set” the frosting, and I stored leftover cake (covered) in the frig as well. Personally I thought the cake got an even richer strawberry flavor after the first day too. So it is ‘make ahead’ approved. I would venture to bet it would also make nice petit four type cakes, set on racks with the frosting poured over the top and topped with 1 perfect strawberry. Maybe small heart shaped cakes! A beautifully homemade, non-chocolate, valentine goodie for your sweetheart! 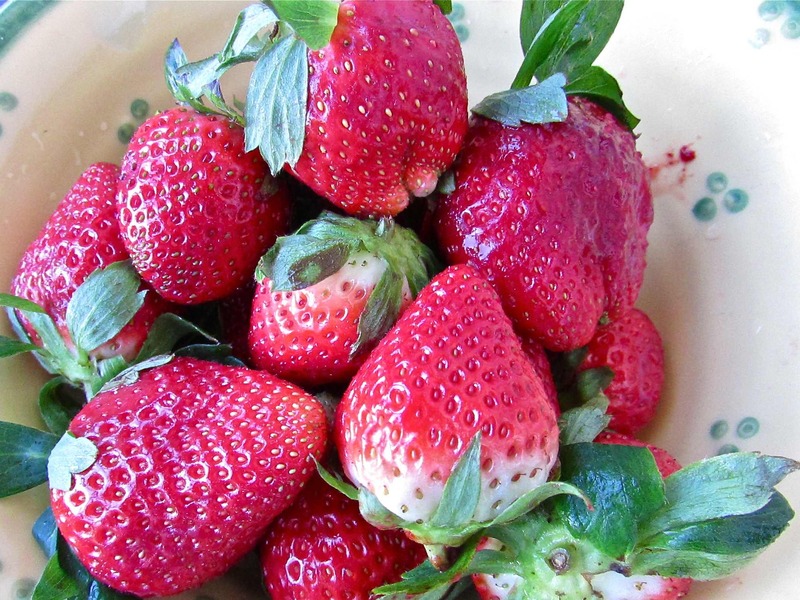 Fresh strawberries always make me feel the love! 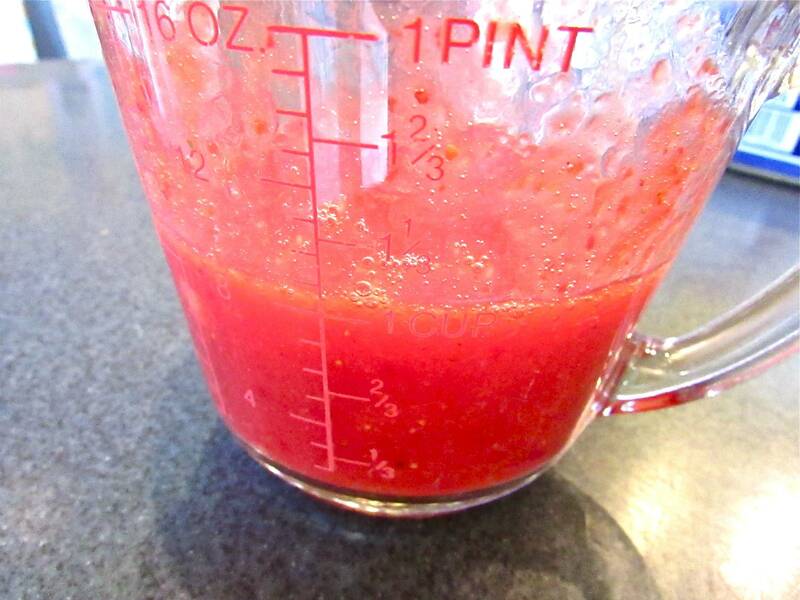 The fresh strawberry puree – there should not be any “chunks” but you should recognize it as strawberry. Mix the unflavored gelatin into the puree and allow to dissolve (stir it well). Add the milk to this mixture. In the mixer cream the butter and sugar, then add the eggs one at a time. Once that is done you will add the extracts and then alternately add the flour mixture and the puree/milk mixture. 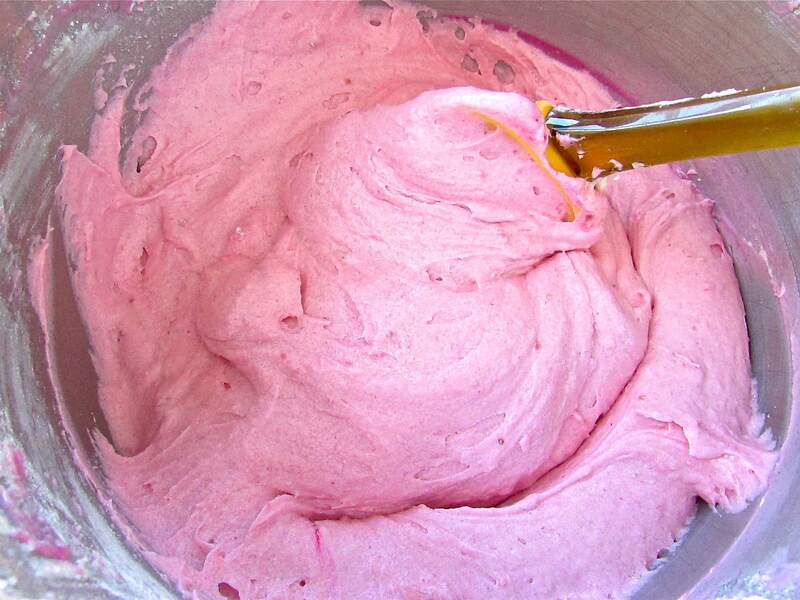 The pretty in pink batter! It smells devine too. Pour the batter into prepared pan(s). I used a 9 x 13 inch pan lined with parchment. After baking, it is still pink! Allow to cool in the pan a bit, then remove to a rack and remove parchment paper. It should be completely cool before frosting! Here is another image of the sliced cake. Preheat oven to 350 degrees. Prepare baking pans by lining with parchment paper. With mixer beat sugar and butter at medium speed until creamy and fluffy (about 5 minutes). Add eggs, 1 at a time, beating until yellow disappears after each addition. Beat in extracts. 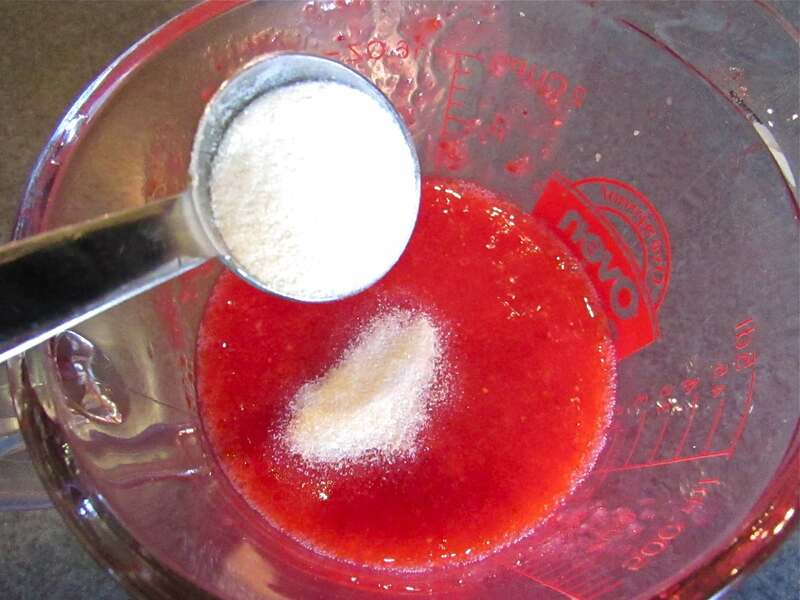 Mix strawberry puree with 1 tsp gelatin and the milk. Set aside. In a separate bowl whisk together flour, baking powder, and salt; add to sugar mixture alternately with milk/puree mixture, beginning and ending with flour mixture. Beat at medium-low speed just until blended after each addition. (Batter will be thick.) Pour into prepared pan(s). Bake in a preheated 350 degree oven. 35-40 minutes in a 9 x 13 cake pan or 25-30 minutes in (2) 9 inch cake pans. Remove from pans, peel off parchment paper, and place on rack to cool. 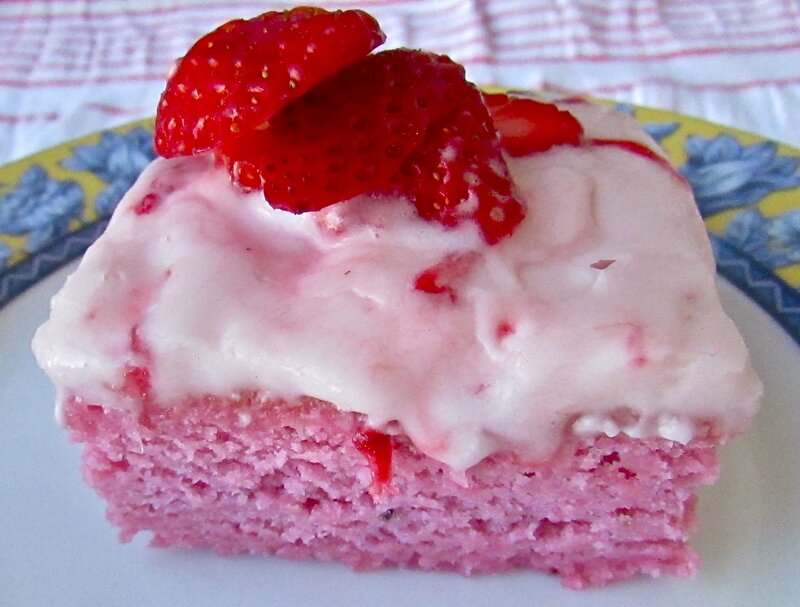 Frost with strawberry frosting. 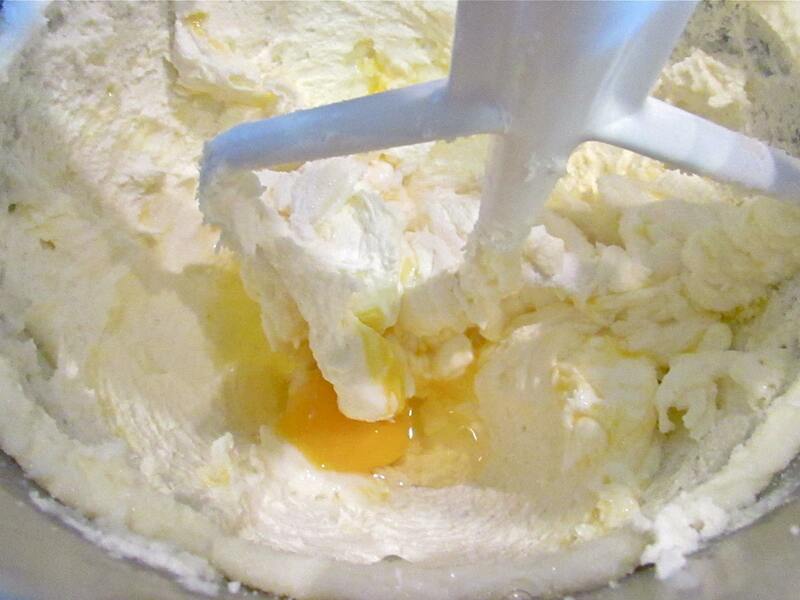 Whip butter and cream cheese until creamy. Add vanilla extract and puree. Slowly mix in the sugar until frosting reaches your desired consistency. Stir in the minced strawberries. Add more confectioners sugar, if necessary. Spread on cooled strawberry cake and top each slice with fresh strawberries.